Vitamin C and Vitamin E might play an important role in curtailing the aging process in men. This nutritional element, which is scientifically classified as L-ascorbic acid, is a nutritional element present in certain foods and various dietary supplements. Despite its nutritional value, people do not produce the chemical biologically. Therefore, individuals can avoid systemic deficiencies only through the intake of adequate quantities of foods and beverages that contain the vitamin. Medical researchers and nutritionists opine that this vitamin elicits several potential health benefits including lowering the risk of cardiovascular problems like heart disease and high blood pressure, helping the body fight infection (the substance contains disease-fighting chemicals known as antioxidants), reducing the occurrence of arthritis, improving the absorption of other crucial nutritional elements like iron and enhancing cognitive functions like memory and concentration. Another major health attribute exhibited by the vitamin-C complex is its ability to combat systemic inflammation. Inflammation results in swelling and damage to the body’s cells, tissues and organs. Should this occurrence be left unchecked, an afflicted individual might experience physical injuries to structures like muscles and bones. The most severe instances of bodily inflammation could also ultimately precipitate serious illnesses such as diabetes, cancer and immune system disorders. Yet another detrimental issue caused by inflammation is premature aging. Cellular damage can damage skin, which can produce wrinkles, sagging, and the development of lines. Should such circumstances arise, the aesthetic appearance of those impacted can significantly decline. Several skin experts and plastic surgeons suggest that sunscreen and lotions containing appreciable quantities of C vitamin can stop and, in some cases, reverse skin-related aesthetic problems in men. Vitamin E is a fat-soluble chemical found in numerous edible items. Human deficiencies of this substance are rare. However, the vitamin may be prescribed as a supplemental treatment for a variety of ailments. Medical professionals suggest that an adequate intake of this nutritional element could play a significant role in improving overall eye health and correcting vision disturbances, as well as improving other bodily systems such as the cardiovascular, reproductive, and central nervous system tracts. Over time, the body is exposed to environmental toxins and pollutants from the foods consumed and the air breathed. These harmful substances produce what scientists refer to as free radicals. When substantial quantities of free radicals collect in the body, they can precipitate the development of inflammation. Vitamin E is categorized as an antioxidant. These beneficial chemicals are noted for their ability to combat the oxidative stress caused by free radicals, thus preventing inflammation and potentially keeping numerous injuries and health maladies at bay. An excess of free radicals also might accelerate the aging process. Ergo, a sufficient intake of vitamin E could be necessary to prevent this unpleasant result. 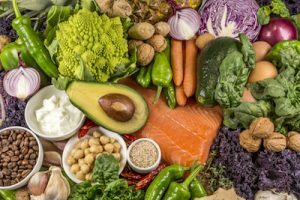 Vegetables: Potatoes, green and red peppers, broccoli, cauliflower, Brussels sprouts, cabbage, kale and spinach are vegetables high in the C-vitamin complex. Fruits: Kiwi, tomatoes, cantaloupe, honeydew, pineapple, strawberries, grapefruit and oranges are among the fruits with increased concentrations of this element. 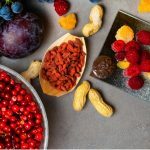 Legumes: Nuts like peanuts and almonds, as well as sunflower seeds, are rife with vitamin E.
Oils:These products are often used to prepare specific foods. Wheat germ, safflower, rice bran and grapeseed oil are thought to contain increased amounts of the nutritional element. Produce: Health-augmenting quantities of vitamin E can be found in vegetables such as squash, spinach, salad greens and avocados. Fish: Sea creatures like trout are believed to contain appreciable amounts of vitamin E.
It is important to note that individual nutritional supplements containing vitamins C and E, as well as preparations containing the substances in combination with other vital nutritional elements, are readily available for purchase at many drug store chains, nutritional supplement retailers and online.